The Lancer Tactical CA-308 Integrated Mag Pouch Chest Rig in Tan is a low profile rig designed for those using M4/M16 style magazines. A total of 4 magazines can be inserted into specially tailored pouches embedded into the chest rig's waist area for a quick and easy access to your ammo supply. Bungee retention cords are available to make sure your magazines stays put. The bungee retention cords also feature easy to pull tabs that can be used to allow you free access to your ammo supply when pulled aside. 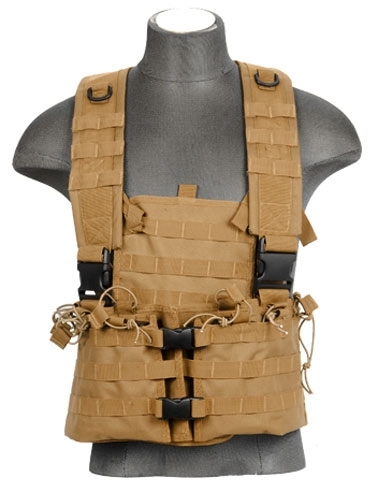 If you need to carry additional gear, you attach additional pouches to any of the available MOLLE panels found on the front, side, back, and shoulder ares of the chest rig. The rear segment is designed with to hold most 2.5 liter sized hydration bladder while quick-release buckles and 4 additional D-Ring loops can be found along the shoulder straps for extra support. 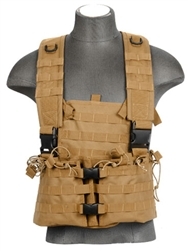 The shoulder and waist strap are adjustable with slide-adjust loops and Velcro flaps that can be sized to accommodate a wide range of users of different sizes and shapes. The entire rig is made with 600 Denier polyester materials so it will be sure to hold its own in the heat of battle whether you're running, gunning, or under fire.